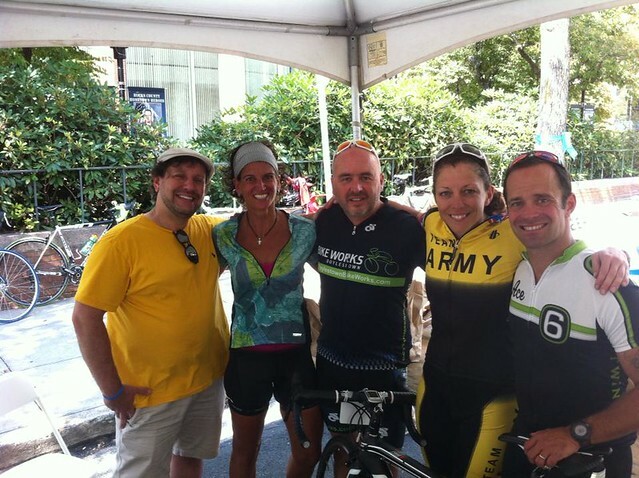 Three years ago, retired Army Colonel and world champion paratriathlete, Patty Solimene Collins, ceremoniously led out the Thompson Bucks County Classic Cyclosportif. We tried to get her to lead us out again. Unfortunately, she had other plans -- representing the United States this Sunday in Rio at the 2016 Paralympic Games. In this guest post, Patty tells us about the incredible reason why she can’t make it this year. But that shouldn't stop you from signing up for this incredible ride through the beautiful Bucks County countryside. I was pretty excited to be asked back for the Bucks County Classic Sportif in 2016. I rode the sportif back in 2013 and it turned out to be an amazing day that led into a pretty spectacular week for me. You see, I’ve ridden a bicycle my whole life. In fact, I grew up in the northwest area of New Jersey where the roads and farm fields are pretty similar to Bucks County. Furthermore, Bucks County was close enough that there was a decent chance some of my high school friends who had taken up cycling in the past few years might join me. When I was a kid, a bicycle was your first taste of freedom. I grew up in a town with no traffic lights, no roads with painted lines, and everyone knew everyone and if a kid needed help with a flat tire or was up to mischief, any grown up would lend a hand with a new tire or a kick in the pants. As I grew up, I always had a bicycle. I discovered triathlon in the late 80s, road my bicycle to class in college and finally dipped my toes into bike racing in 2004. As much as bicycling was part of my life then, it’s even bigger now. In 2006, after returning home from a deployment to Iraq (without as much as a paper cut) I was unfortunately struck by a car while cycling to work. Like any cyclist, my first question was “How’s my bike?” Well, the bike wasn’t in too good a shape, and as it turns out I wasn’t either. Alas, that was years ago, so lets just fast-forward to the good stuff. My injuries were significant enough that I elected to have a below knee amputation. That was on May 9, 2007. I got back on my bicycle on the 4th of July 2007. It wasn’t far, it wasn’t fast, and you better believe I fell trying to clip out of my pedals on my prosthetic side a couple of times. I didn’t care, I felt just like I did when I was 12 and took my first spin by myself out of my neighborhood! The cycling continued, I dipped back into racing a little bit, and eventually found my way back to triathlon. In fact, I discovered I was still a decent age grouper. I also discovered there is this whole new world of para sports for people with physical disabilities (amputees, wheelchair racers, visual impairments, etc). When I was asked to ride in the 2013 Sportif by one of my great high school friends, Mike Maney, I looked at my calendar and figured I could easily swing that ride the day before I flew to London to race in the ParaTriathlon World Championships. A side note on Mike, he was probably one of the best all around athletes in my high school. He played Fall Soccer and ran Spring Track, and he was pretty amazing at both. I shamefully admit, I was a little happy to discover middle age set in and Mike wasn’t quite the athletic specimen I recall. I might have actually out climbed him a time or two on the hills. (I probably had a nicer bike, with lighter wheels, but I digress). It was an amazing day, a beautiful course, super volunteer support and I’m riding with three high school friends for 60 miles!!! I didn’t think the day could get any better. We started off in a flurry and then settled into a nice rhythm. Along with a couple hundred other cyclists, we were just enjoying the day. A few miles into the ride I wound up chatting with a gentleman with an English accent. He’s done the ride for years, I was headed to London, we had much in which to discuss. About 45 minutes into the ride we start talking about the Paralympics. My new friend, Thurston, tells me his father was quite instrumental in the development of the Stoke Mandeville Games, the precursor to the Paralympics. He then went on about his father being a pretty talented middle distance runner in Great Brittan in the 50s. While this conversation was pretty good as we pedaled along through the beautiful countryside, at this point I sat up on my bicycle because this conversation just became FASCINATING. I asked my new friend what his father’s name was. “Oh, right, Roger.” To which in my most New Jersey Italian enthusiasm I yelled, “Thurston, your dad is ROGER BANNISTER?!? !” “Oh, you’ve heard of him?” Unbelievable! I’m not sure if he was most surprised that I nearly knocked him off his bike with my exuberance or that I had heard of his father! Honestly, even cyclists know Roger Bannister was the first person to break the 4 minute mile. The ride continued, me still in awe, as we approached our first rest stop. Honestly, I was training for short course triathlons, so 30 miles was a good ride for me, but today we had 60 on tap. I was more than ready for the first rest stop. We rolled into Ringing Rocks. After some great conversation with the superb volunteers and filling up on snacks and water, I thought we were off. My new friend asks me if I have ever rang the “ringing rocks.” So off we go in our cycling shoes. Remember I wear a prosthetic, climbing over boulders to find a hammer and give these rocks as ring! Who knew? I spent the first 22 years of my life not to far from Ringing Rocks Park, and I had never even heard of it, but on one crazy bike ride in September I am hammering on rocks with Roger Bannister’s son. Life is crazy and beautiful, but not always at the same time. Today it was! I’d like to tell you the second half of the ride was just as exciting, but honestly, how do you top that beginning? The roads and conversation and rest stops were all fantastic, and it stands out easily as one of my most memorable rides ever! I went on to London and won a Silver Medal in the World ParaTriathlon Championships 6 days later, came home and guided my first visually impaired athlete in a triathlon 48 hours later. It was a whirlwind week filled with unforgettable memories, but the most memorable was, without a doubt, the Bucks County Cycle Sportif. Patty Collins is a retired Army Colonel with 25 years Active Service. After her retirement in Dec of 2015 she committed to training for and earning a position on the 2016 US Paralympic Team. She will race in the first ever Paralympic Triathlon on September 11, 2016. Somehow, the Copacabana Beach in RIO is only a wee bit more enticing than Buck’s County’s Cycle Sportif. Her goals following RIO include finding a job and signing up for the 2017 Bucks County Cycle Sportif.